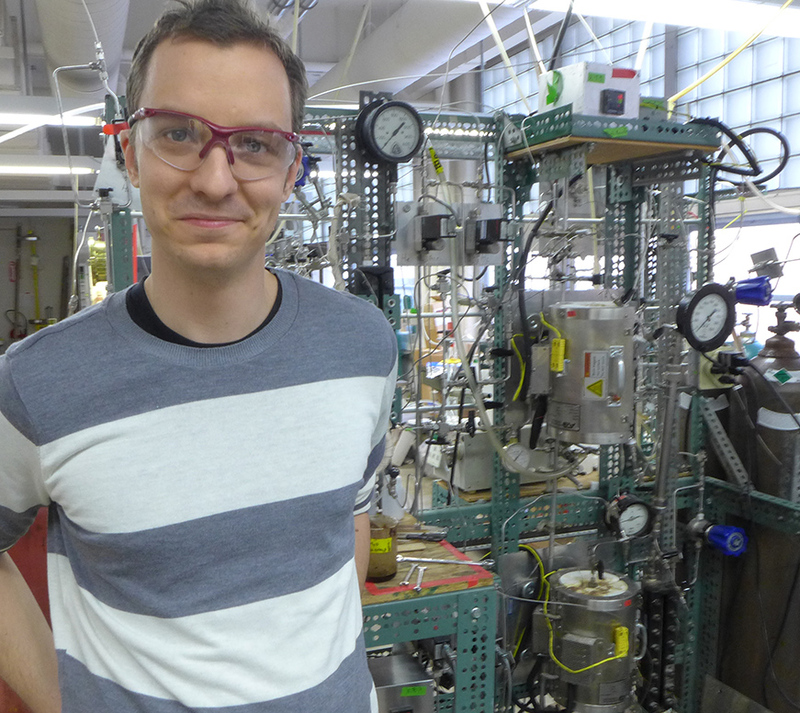 Research in the lab of James Dumesic at the University of Wisconsin-Madison has shown a new, chemical route to making biofuel from cellulosic biomass. The sugar gathers in the clear fluid at the bottom; the dark fluid above contains the active ingredient for the new process. On Jan. 23, the U.S. Environmental Protection Agency announced a possible reduction in the renewable fuel standard for cellulosic ethanol, due to short supply. Biofuels are made from organic materials. Because the carbon dioxide released during burning is absorbed in the next crop, biofuels have less greenhouse-gas impact than fossil fuels. In the United States, the biofuel story is all about corn, because the kernels contain sugar that is easily fermented into alcohol. Monthly production of ethanol for gasoline reached 1.1 billion gallons in July, 2012. That year, biofuel devoured 39 percent of the giant American corn crop. Cellulose, contained in waste from farms, forests and factories, also contains carbohydrates that can become fuel. Yet the conversion is difficult, expensive and rare, as the EPA pullback illustrates. Pending further reduction in the standard, industry must blend 6 million gallons of cellulosic ethanol into gasoline by June 30, 2014. 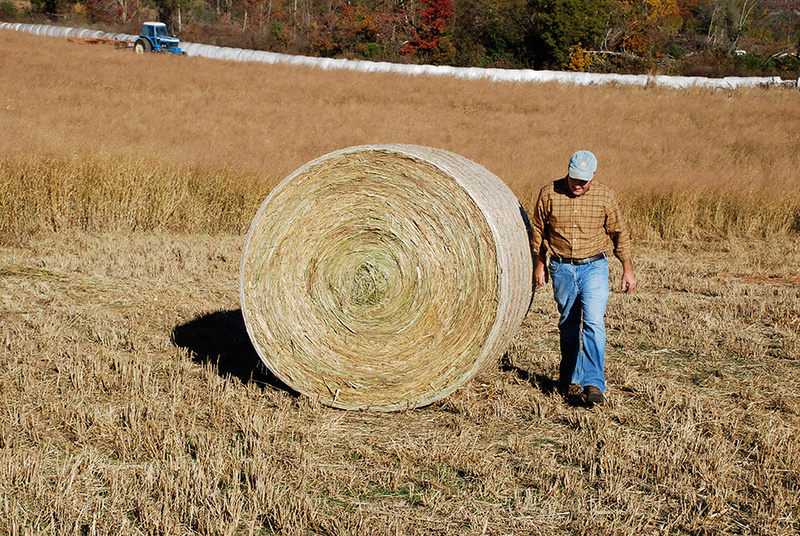 When the conversion of cellulose into biofuel becomes routine, switchgrass, a highly productive grass that regrows from the roots, could become a large source of biomass energy. That fuel seems unavailable, but in Italy, Beta Renewables has started running a plant capable of converting cellulosic biomass into 60,000 tons of ethanol per year. In the United States, several major companies are betting serious money on biofuel from cellulose. “DuPont has steel in the ground in Iowa, ADM has steel in the ground in Illinois, Iogen has it in Brazil,” says Tim Donohue, director of the Department of Energy funded Bioenergy Research Center at the University of Wisconsin-Madison. Depending on design, cellulosic biofuel plants can accept residues from cornfields, a dedicated crop called switchgrass, or other high-cellulose materials such as tree trimmings or food factory waste. New techniques in genetics, plant breeding and chemical engineering are integral to the long quest to convert cellulose into fuel. But there is also a growing interest in algae, simple photosynthetic organisms that can harvest sunlight, as a raw material for advanced biofuel. 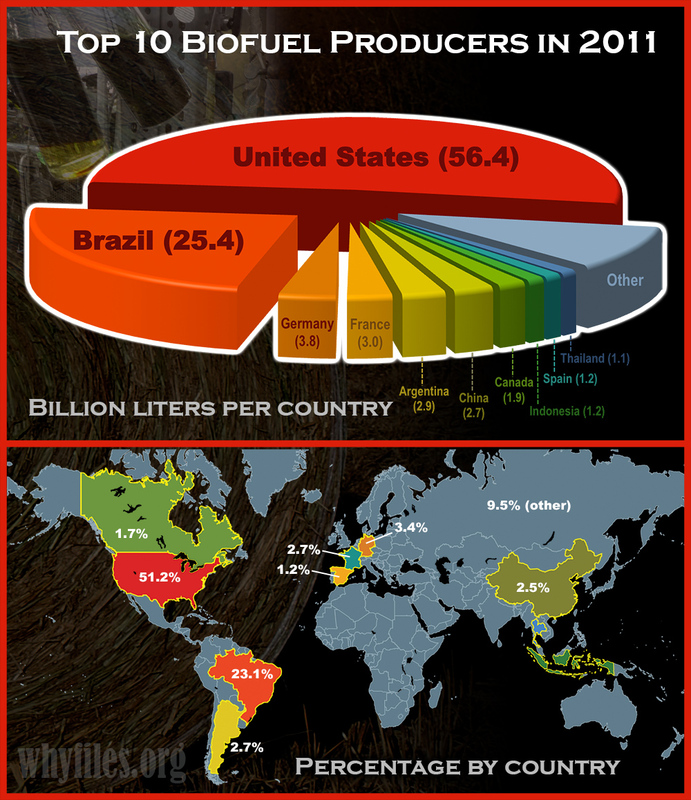 Global biofuel production reached 110 billion liters (29 billion gallons) in 2011. The United States and Brazil supplied 74 percent of global output. 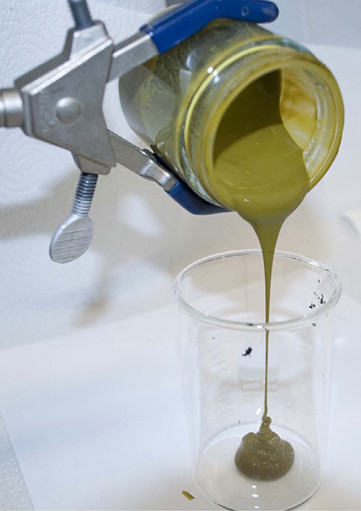 Extracting simple sugars is the first step in making biofuel from biomass. These sugars are then fed to microbes or otherwise processed into a flammable product, such as ethanol or other fuel molecules. Lignocellulose, the most abundant organic substance on Earth, has three major constituents — cellulose, hemicellulose and lignin. These combine to protect energy-storing sugars and give the plant cell wall strength and structure. Cellulosic biomass is built on a durable structure called lignocellulose that contains cellulose, hemicellulose and a binder called lignin. Cellulosic materials are tough, but if nature can make it, nature can break it. For millennia, people have sourced useful microbes and molecules in nature. Brewers, vintners and bakers use yeasts to make beer, wine and bread; doctors learned that fungi create antibiotic molecules that kill bacteria. Cellulosic biofuel researchers are following suit as they seek microbes and enzymes that can break down lignin and cellulose. Herbivores, which live by digesting high-cellulose food, are a natural place to look for active microbes, and so when O’Malley began working in the Boston area, she visited a horse farm to scoop poop. From that messy raw material, O’Malley and her collaborators isolated a fungus named Piromyces and identified all the genes involved in making enzymes and other proteins. 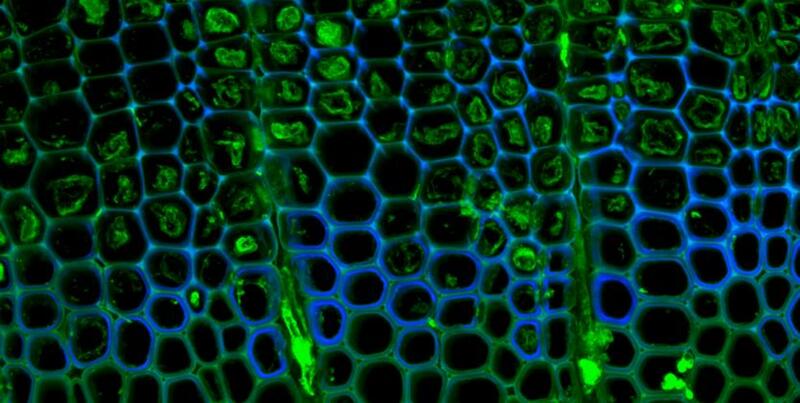 The project identified hundreds of enzymes that can break down lignin and cellulose. Organisms like this fungus, derived from a horse intestine, are a possible source of enzymes to degrade lignocellulose. 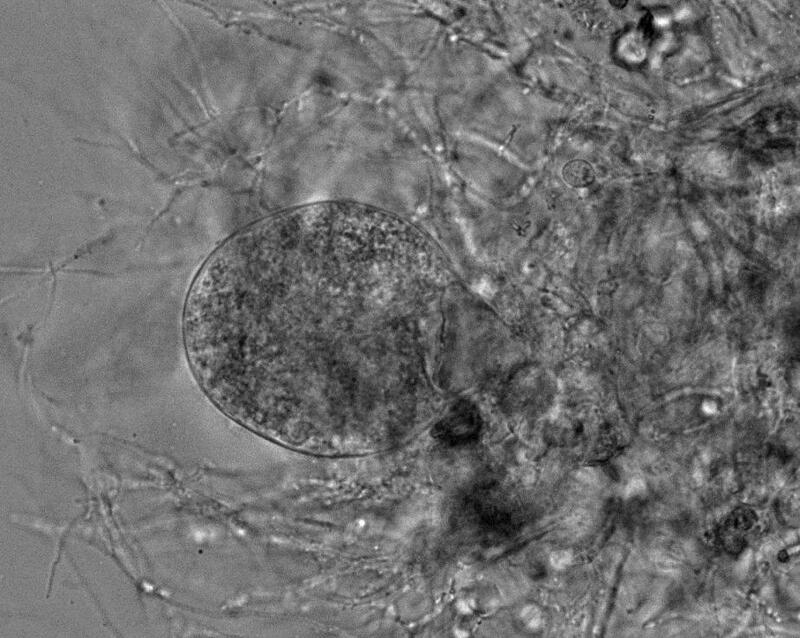 The cell body of the fungus (the circular blob in center), is surrounded by rhizomes, feeding tubes that it inserts into woody material to start the process. The most active of those enzymes, she says, deals with “lignin in ways that other microbes have difficulty doing.” The plan is to transfer the enzyme’s genetic machinery into a common industrial yeast. From her position in the chemical engineering department at the University of California, Santa Barbara, O’Malley has isolated other ferocious fungi from the tail ends of giraffes, elephants, sheep and goats at the Santa Barbara zoo. Post-doctoral researcher Jeremy Luterbacher stands before experimental plumbing used to test a conversion from cellulosic biomass into biofuel at the University of Wisconsin-Madison. Luterbacher works with James Dumesic, a professor of chemical engineering with a long history of sourcing valuable chemicals from biomass, at the Great Lakes Bioenergy Research Center and the department of chemical engineering. Others are investigating chemical routes to that destination. Many strategies proposed to decompose lignin begin with a hot, acidic treatment that exposes the cellulose to enzymes or microbes. But that’s is expensive. On January 17, researchers at the University of Wisconsin-Madison reported1 a technique that converted corn stover, pine and maple wood into a sugar solution in a single step. The process relies on a chemical called gamma valerolactone (GVL) that, at moderate temperature and without acid pre-treatment, converts cellulose and lignin in shredded plant material into sugars. The output, a sugary solution, is ready for production of biofuel, and the GVL can be removed for reuse by bubbling liquid carbon dioxide through the solution. “You don’t have to boil it off or put in a lot of energy or additives,” says study co-author Jeremy Luterbacher. “Not only don’t we want to use new GVL, we don’t want GVL in the mix; it might kill your bugs if you are doing biological decomposition” of the sugars. Extracting value from lignin, and producing a variety of chemicals “can both radically change the economics of the whole cellulosic biofuel process,” Donohue says. 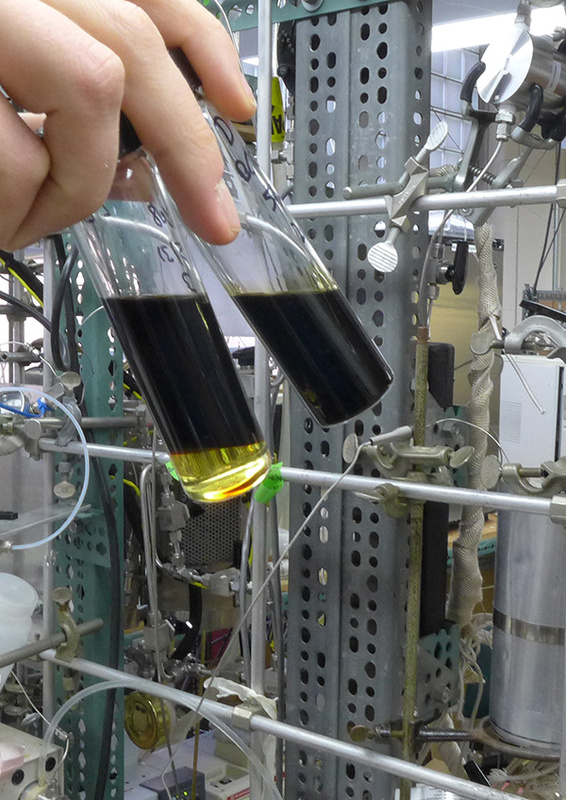 Precursors to lignin glow bright green after bioenergy researchers tag molecules before they are converted into lignin. The tagging may lead to ways to change lignin or reduce its concentration in biofuel crops. Already, Virent sent synthetic gasoline for testing by Royal Dutch Shell, and received the highest (“no harms”) rating in fleet testing. Although the gasoline was made from conventional sugars, the same compound could be made from cellulosic feedstock, Woods says. Beyond the economics, federal regulations are also a factor. In November, the U.S. EPA moved to reduce usage of renewable fuel (almost all ethanol) in 2014 by about 3 billion gallons below the present level of 18.15 billion gallons per year. Biofuel can be made from algae grown in ponds located on the Gulf Coast, the Southeastern Seaboard, and the Great Lakes. 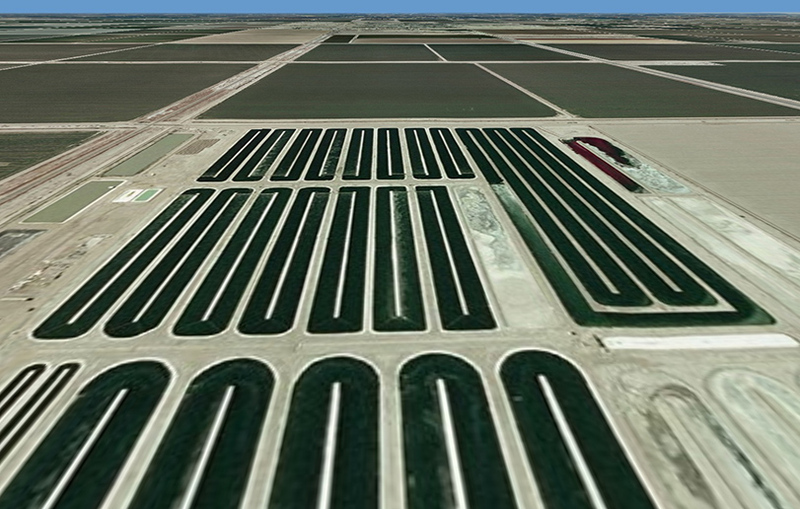 This satellite photo shows “raceway” ponds in Southern California. A second area of intense biofuel interest is algae, primitive photosynthetic organisms that live in water. According to a recent government report, an all-out mobilization of U.S. water resources could produce 25 billion gallons of biofuel from algae, about one-twelfth of the 284-billion-gallon annual national demand for liquid motor fuels. That mountain of algae would grow in shallow ponds of fresh, brackish or salty water, with phosphorus and nitrogen fertilizer. Although saltwater is limitless, it’s only available near the seacoasts, and questions about salt contamination of soil and groundwater would need to be answered in advance. Could these Antarctic cyanobacteria be genetically tweaked to adopt a 24/7 lifestyle, and generate more raw material for a biorefinery? In a 2013 study in the journal Marine Drugs, Zhang and colleagues concluded that production must be accelerated via new genetic tools to control the algae’s metabolism. One promising tactic would ramp up gene activity by altering stretches of “regulatory” DNA. 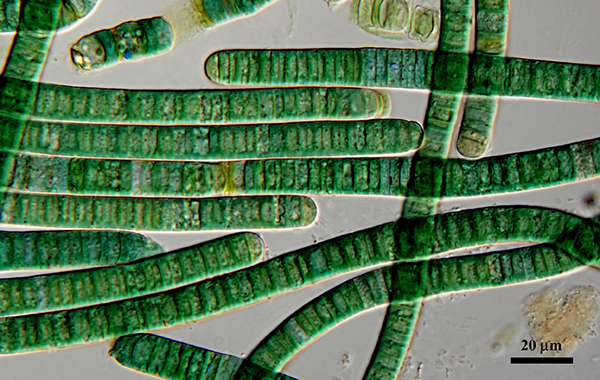 Cyanobacteria get their energy from sunlight; so artificial lights would be needed to optimize the 24/7 clock; Johnson suggests these could be powered by the biofuel product. Johnson notes that he does not specialize on biofuel and has not done a cost-benefit calculation, but adds that manipulating the clock could also be handy for making drugs, hormones such as insulin, or other high value targets. Even if the algae do not work full-time, it helps if the processing plant works on a flow-through basis, rather than on single batches, the usual laboratory approach. Using moderate temperature and pressure, Douglas Elliot of Pacific Northwest National Laboratory has demonstrated a way to continuously decompose a slurry of algae and water. No ordinary pea soup! This “biocrude” is made in a continuous process that suggests a route toward industrial-scale production. The raw material for the process is a soup of algae and water, so energy-intensive drying is not needed. The product is a water-based biocrude solution that can be catalytically converted into a range of hydrocarbons. Once dissolved chemicals are removed from the water, it is clean enough to grow another crop of algae. Genifuel, of Salt Lake City, has licensed the technology and is building a larger apparatus for further tests. Price is always a factor in biofuels, and with conventional gasoline drifting down toward $3 a gallon, that superb fuel is also one of the cheapest liquids you can buy: cheaper than soda, milk, even many bottled waters. Tar sands = Clean oil?